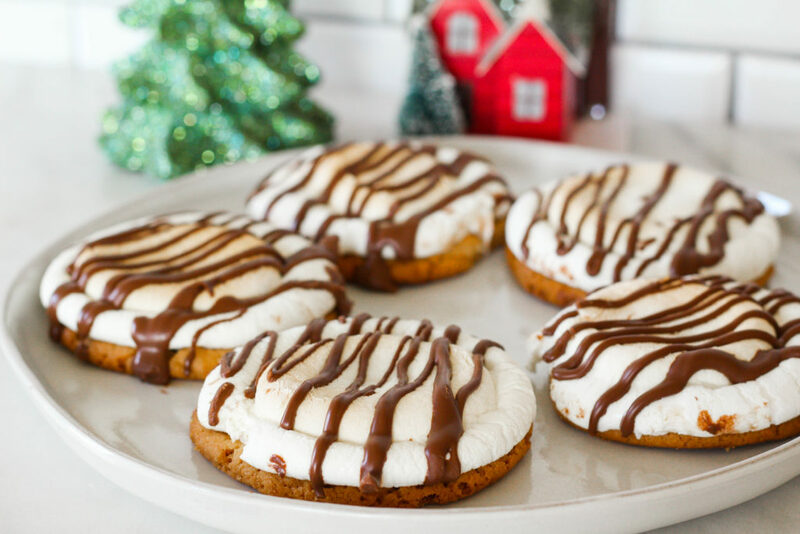 Chewy peanut butter s’more cookies, topped with a toasty, melted marshmallow and drizzled with sweet chocolate. 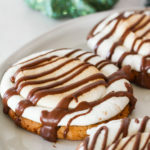 For any chocolate and peanut butter fan out there, these peanut butter s’more cookies are sure to please. I have a huge love of marshmallows. When I was a kid I used to take a giant bowl, fill it up with marshmallows, nuke it for a few seconds, and eat it with a spoon (I’m not sure where my parents were when I was doing this). Anytime s’mores are offered or even just marshmallows in hot chocolate, I’m first in line. I’m not a huge fan of the graham cracker when making s’mores– I wish you could make a s’more using just the marshmallow and chocolate but that would get pretty messy. Me and my siblings used to wedge a piece of chocolate inside the marshmallow and roast it over the first as-is without the cracker. YUM. Here’s a video to show you how easy these cookies are to make! You see though, something magical happens when you pair chocolate and peanut butter. And wouldn’t a chewy peanut butter cookie make a much better s’more vehicle than a graham cracker? I may be biased by my long time love for marshmallows but I do think a peanut butter cookie would be much better. That’s where these cookies came in. I used a slight variation of the Betty Crocker original peanut butter cookie recipe, and then in the last 3 minutes of baking, added a giant marshmallow to each cookie. Then I used a spatula to flatten them down once they got all soft and goey. On top goes a sweet chocolate drizzle! 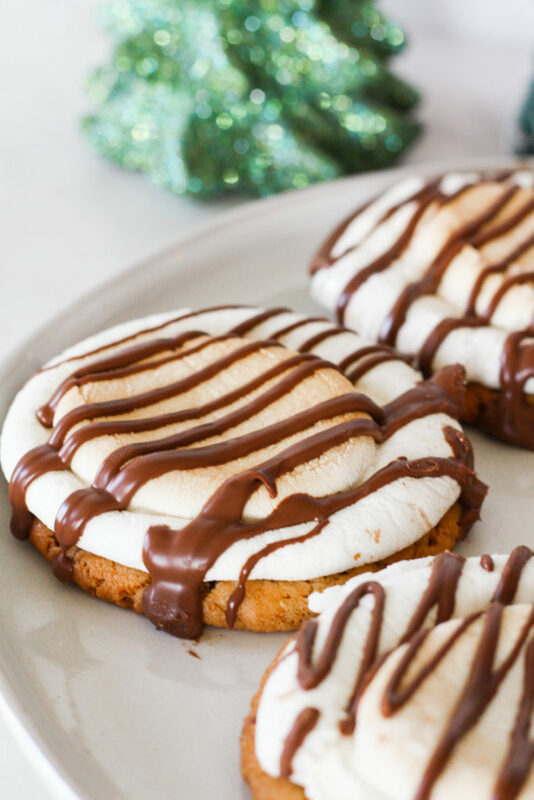 There you have it, peanut butter cookies made into s’mores. Make these for your cookie exchange this year (I plan to!) or make a big platter and serve them with your Christmas dinner. Everyone will love them! I’ve also got another delicious dessert recipe that includes apples and cinnamon, if that’s more your style: Apple Roses. Mix sugars, peanut butter, butter, and egg in a large bowl. Stir in remaining ingredients. Cover and refrigerate for 2 hours. Preheat your oven to 375 F. Shape dough into 1" balls (about a teaspoon). Place on an ungreased cookie sheet. Flatten in crisscross patterns with a fork. Bake 8-9 minutes until just light brown. Place a marshmallow into the center of each cookie and bake for another 2 minutes. Remove from oven and use a spatula to flatten the marshmallows. Let cool for 5 minutes, then remove from cookie sheet and cool on a wire rack. Melt the chocolate in a small bowl in 30 second increments. 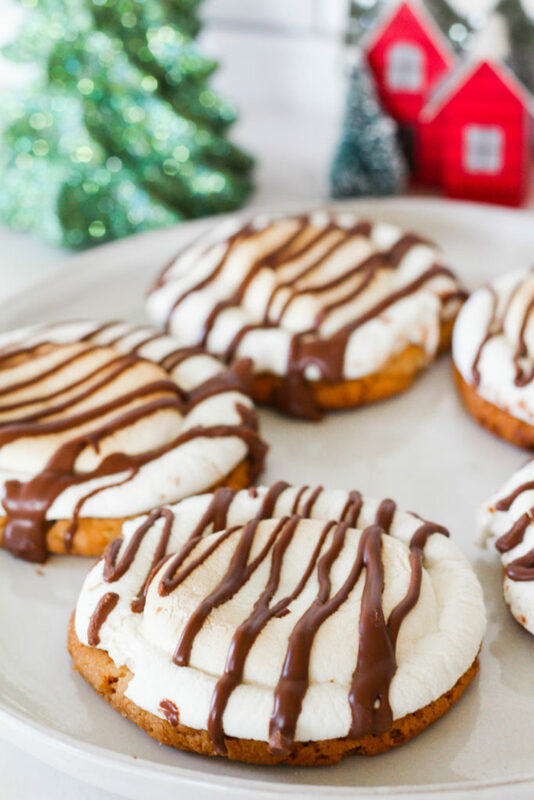 Using a spoon, swirl chocolate onto each cookie. I can’t wait to make these!! I love using peanut butter cups instead of plain chocolate in my s’mores! !